Stornoway Rugby Club’s wonder-15 stars saw off a combined Huntly/Moray Select at Bayhead with a convincing 24-5 victory. Competing in the quarter final of the U15 SRU Caledonia Plate the Stornoway teens were in imperious form althiugh they had began the game apprehensviely having travelled to Huntly two days prior to play in a school competition and were resoundly beaten 30-5. The game started well with the forwards taking on most of the game. After about 10 minutes Stornoway had a scrum on half way which was shipped out to the backs where Calum MacLeod playing at inside centre made a lovely arcing run round his opposite number and floated a pass out to winger Alfie MacMillan to break away on the wing to score the opening try. Huntly/Moray broke back quickly after two further minutes where a badly controlled ruck was kicked on by their inside centre to score under the posts. Shortly before half time the Stornoway pack had their opposition on the back foot and were playing quick ruck ball to good effect. 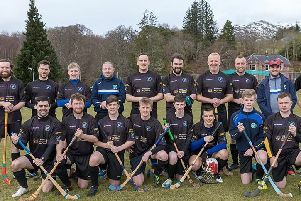 As they approached the 5 metre line Uisdean Smith with the support of the pack drove over for the Stornoway side to take a half time lead of 10-5. The second half was very even and the only difference between the side was the growing partnership of Calum MacLeod, Rory Mighton and MacMillan in the backs. Two more tries were scored in the second half by Alfie to collect his hat trick. Both tries were converted by Cameron McClements.